I. 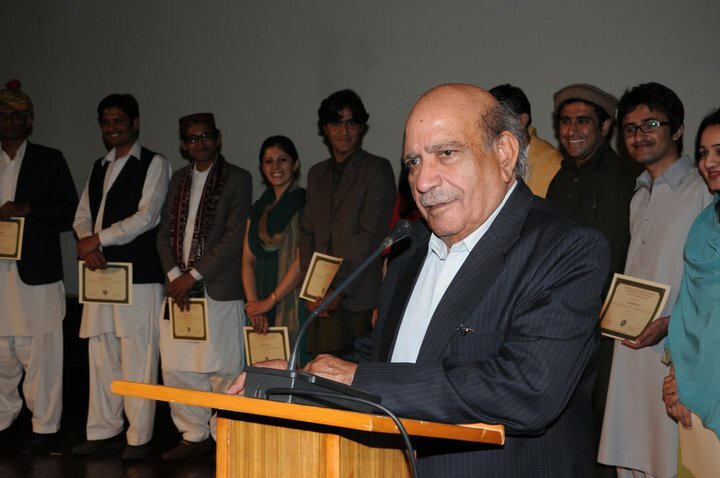 A. Rehman speaks at a event honoring his work. Photograph from I. A. Rehman Facebook page. Written by Yelmaz Mujtaba, Legal Research Associate, Bolo Bhi. The original version of this post was published on Bolo Bhi's blog. It appears here as part of Global Voices Advocacy's partnership with Bolo Bhi. Policymakers in Pakistan have proposed a new law that seeks to to strengthen security forces including the Army, Frontier Corps, Police and Rangers in the battle against terrorist groups in Pakistan. But critics see the new “Protection of Pakistan Ordinance” as an attempt to turn the country into a police state, where the abilities of law enforcement will disproportionately increase, with little or no checks on their powers. Passed by Parliament as an Act on July 3, 2014, PPO was first introduced by the President of Pakistan under the recommendation of the ruling party on October 20, 2013. The law’s proponents argue that it represents a necessary step in curbing security threats in the country, where acts of violence driven by political, sectarian and religious interests have increased steadily over the last decade. Supporters of the Bill also say that it stands in line with anti-terrorism laws such as the USA PATRIOT Act, passed in the U.S. only weeks after 9/11 in order to strengthen local law-enforcement agencies in combating home-grown and international terrorist threats to the US. They also cite the UK’s the Anti-terrorism Crime and Security Act of 2001. But both the government and supporters of the Bill have ignored the implications that it could carry for fundamental rights online. If implemented in its current form, the consequences of the law on citizens’ rights will be far reaching. A competing draft of the original Ordinance, which has since been amended by the Senate and passed Act of Parliament (henceforth known as the “Pakistan Protection Act”), attempts to address some of the concerns raised by critics, but questions still remain. Bolo Bhi asked legal experts and human rights activists for their views on the legislation. Human Rights Commission Chairperson Mr. I. A. Rehman, a long-standing advocate for human rights in Pakistan, spoke to us about the law’s journey from Act to Ordinance and its implications for free expression online. Bolo Bhi: How different is the Pakistan Protection Act (PPA) from the Pakistan Protection Ordinance (PPO) when it was first tabled? Does the PPA address the concerns raised regarding the PPO? I.A. Rehman: The text as given in the original ordinance hasn’t been radically revised. A few of the concerns have been met. For instance, the period of detention on remand has been reduced from 90 to 60 days, though preventive detention for 90 days and more is allowed. Appeal from the special court’s decision now lies with the High Court instead of the Supreme Court. No police officer below BS 15 can order firing; the rules have to be placed before parliament and some sort of inquiry into death by firing has been proposed. But the final version does not meet our concerns regarding the possibility of abuse by targeting political dissidents, the retrospective application of the law to legitimise illegal detentions (especially in Balochistan), and legitimisation of safe house. The definition of ‘Enemy Alien’ was better in the Ordinance. A new section allows the government to add new offences to the schedule which violates the parliament’s authority. BB: The PPO was critiqued for its vague definitions. Are terms such as insurgents, cyber crimes etc., clearer in the amended version? IAR: Insurgent and cyber crimes are not defined at all. The other definitions are vague and liable to subjective interpretation. BB: Is the current iteration of the PPA in line with constitutionally protected rights & guarantees afforded to citizens of Pakistan? IAR: By making detention beyond 90 days subject to judicial review under Article 10 of the constitution, an attempt has been made to stay within constitutional limits. However, the PPA impinges on the people’s basic rights and hence it is in violation of the basic law. An equally important issue is the open possibility of the abuse of the law in view of the situation not only in the conflict zone but also in Balochistan and Sindh. The proposals regarding enemy aliens seem to be in conflict with the international laws of war. BB: Does the PPA follow constitutionally proscribed due process standards vis-a-vis detention, warrant-less searches, burden of proof and evidence? Are they adequate? IAR: There are deviations from due process regarding searches, use of fire power, presumption of guilt – that the state has been justifying through special laws (Anti-Terrorism Act, for instance). BB: Is there scope for misuse of this law, especially with regards to the powers conferred upon law-enforcement agencies? IAR: Great scope for misuse of law is there. BB: What in your opinion still needs to change in this piece of legislation and what should be the way forward? The Protection of Pakistan Ordinance was seen and criticized as a deeply flawed attempt at solving a serious problem in Pakistan. The opposition in Parliament promised change, and for once, the people of Pakistan trusted in those promises when the PPO was first blocked in the Senate back in April 2014. But those promises of change now seem to ring hollow. We now have in place the Protection of Pakistan Act, passed by both the Senate and the National Assembly. Its much heralded amendments, as highlighted above, do little – if nothing – to rectify the flaws that existed in the original document. Arguably, they seem to enhance the scope for violations that were present within the PPO. If Pakistan is to take the war against terrorism and crime seriously, it must ensure the State does not become the same criminal it is locked in a fight against. We should not have laws that compromise the fundamental rights of citizens. As far as the Protection of Pakistan Act is concerned, a serious rethink is required in order to reassess the state’s strategy in combating crime and terrorism. *Under Pakistani law, the head of the executive (the President) can, by executive order pass into law any legislation for a duration of six months. Such executive laws are called ordinance’s and only attain status of Act of Parliament once the Parliament passes them at the end of their six month period.